It's always nice when you can get extra stuff for free. Like going and getting a free appetizer with a meal. Or maybe free refills on drinks. Or all the free fries you can eat. And maybe I'm hungry for dinner. What of it? 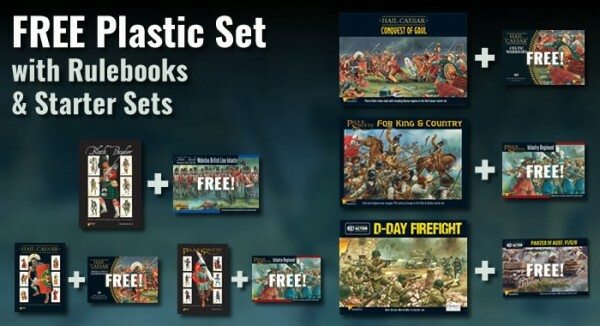 Anyway, Warlord Games is giving some free stuff away when you buy a rulebook or certain army sets over in their webshop. It's pretty simple. Just go to their store and pick out a rulebook of your choice. You'll then get a drop-down menu that lists off all the different plastic box sets you can get for free with that purchase. The same goes for some of the army sets they've got. So if you want to start out a new game, or get a cool friend to get them into your favorite game from Warlord, you've got the rulebook and a little something extra to go along with it.